Dropdown fields allow users to select an option from a list of options. The options will only be visible when the user clicks the dropdown arrow, so you can add as many options as needed and it won't take up unnecessary space in your form. In addition to the standard field options, Dropdown fields have several field-specific options. 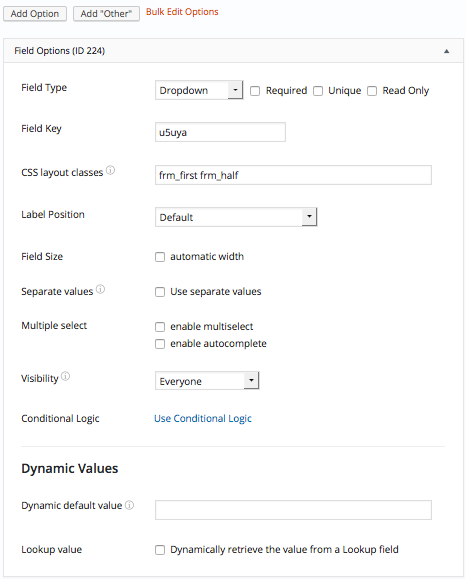 Browse the sections below to learn more about the options specific to Dropdown fields. Click this button to add a new option to your field. Use the Bulk Edit link to add, edit, or remove a lot of options quickly. Click the 'Bulk Edit Options' link and type or paste your options into the box that appears. 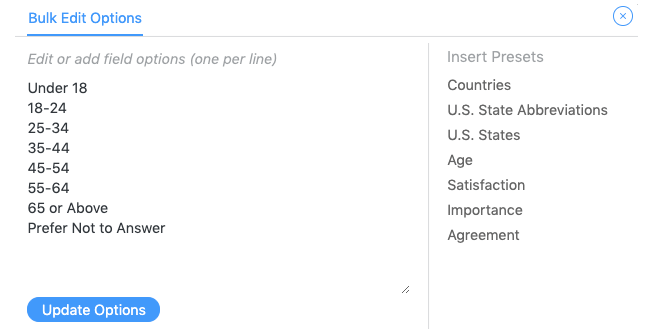 You can also use this option to populate your field choices with a ready-made list of Countries, U.S. States, U.S. State abbreviations, age ranges, levels of satisfaction, importance, or agreement. Note: you need to check the separate values checkbox, as described below. Allow users to enter free text with an 'Other' option. Click the 'Add Other' box to add this option. Check this box if you would like to store an entry as a value distinct from the selected value. For example, if your user selects 'black t-shirt', you can store the value as 'black t-shirt $25.00'. Read more about separate values. Check 'enable multi-select' to allow users to select multiple options from a dropdown. The user needs to hold down command or control to select more than one option. Check 'enable autocomplete' if you would like your dropdown to use the Chosen script to change the dropdown appearance. Autocomplete allows visitors to begin typing what they are looking for in order to find it more easily. If you select both 'enable multi-select' and 'enable autocomplete', the user does not have to hold down command or control to select multiple options. Please note that autocomplete is disabled on mobile devices. The default value icons can be used to specify whether an option selected in a Dropdown field on the form builder page should be a default value or a placeholder. Learn how to set a default value and how to set a placeholder in a Dropdown field. Display the value submitted in a Dropdown field in a form's confirmation message, email, or View. Display submitted option(s): Display the option(s) selected in a Dropdown field. Replace x with the ID or key of the Dropdown field. Separator: If 'enable multiselect' is checked, you may use a different separator for Dropdown field values. By default, this will be a comma. Populate a Dropdown field with WordPress posts with the frm_setup_new_fields_vars hook. Remove used options with the frm_setup_new_fields_vars hook. Add user list to a Dropdown field with the frm_setup_new_fields_vars hook. Create a new set of preset Bulk Edit options with the frm_bulk_field_choices hook.